So, you can be new to self storage or you might’ve tried storing before. But have you tried to ask, what are the things to consider for mobile self storage? I mean, it’s understandable to be less picky about it. And just simply grab the quote closest to your budget. But the thing is, there could be more to it than what you might have in mind. Storage companies can offer more than what’s common knowledge. Especially if you succeed in choosing the right partner. Having said that, let me offer some insights into how do you evaluate your prospect company. And if you are already storing right now. Then these inputs should tell you whether you made the right choice. In order for you to know what are you looking for in storing, you need to know what are your needs as a client first. Assess how much possession do you like to store. And the length of the service required. These are the greatest factors that will contribute to the overall expenses and can really affect your budget. Which would be very crucial especially in cases of office relocations. Where you are only storing stuff that is to be delivered to the relocation site only after everything else has been moved in. Because in such case, you won’t really want to end up overspending in storing because you will need the money for commercial office removal services. Now if you are not too concern about the budget on the other hand. You simply need space for some stuff and does not really want to get rid of them. Then might as well determine how valuable is the stuff that you want to store. How much preservation do they require? Are they sensitive to moulds and mildew? All in all, the aforementioned considerations are simply examples of how do you assess your needs. However, this assessment is situational. But nonetheless rather the most essential among the things to consider for mobile self storage. Therefore, it would, be clever to make a list of your needs and see if your prospect can answer all of them. Generally speaking, location does not often affect the costs of storing. But when it comes to convenience and access to your belongings, you might want to reconsider. Especially if your purpose in storing requires you to check on your stuff every now and then. For example, if you are doing business storage and is storing your goods, then it would be better if the warehouse is closer to the city. Not unless if the company offers delivery of your package. Just as Macys Mobile Storage do. Because in such case, you can just easily inform them when and where to deliver the goods. I’d like to discuss accessibility a little further if you don’t mind. Because some facilities may incur additional fees if you need 24/7 access to your goods. Better make inquiries upon signing up. Moreover, some may not even have that convenience available. Although, it’s worthwhile to highlight that Macy’s do not incur such fee. And you can you have 24/7 accessibility with us. Provided that you let us know 24 hours prior to your visit. What’s more to that for you, is that we do not have access to your modules. No one does. Unless you give them your keys. Which we should not have a duplicate of, by the way. Thus, in a much clearer summation, you are the only one who has access to your stuff. No other stuff is better than free stuff. True enough eh? So, in choosing your self storage company, check for promotions and special offers. Even if they do not have free stuff, surely, they have other things to sweeten the deal. With Macy’s on the other hand, we do offer free re-delivery. As well as free blankets. Not sweet enough? Then get this, if you find any cheaper deals anywhere we’ll beat it by 10%! In any service you want to avail, you need to keep a high level of wit. It’s not that you’d really end up with a deal that’s a sham. But it’s best to zero out contingencies right on. Furthermore, at the end of the day, the level of customer satisfaction you will get at end of the service is co-dependent on your own initiative as a customer. If you don’t want to get disappointed with the overall experience, make sure you did your part as well. Contemplate on the things to consider for mobile self storage before making any arrangements. 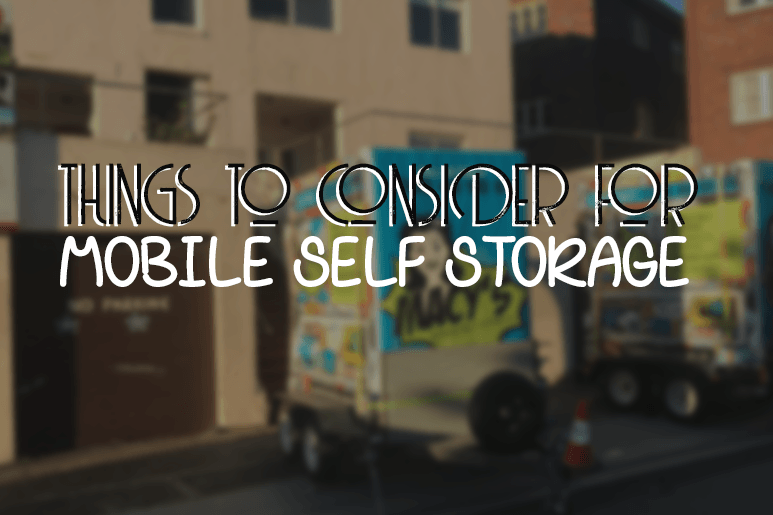 Did you like our article 5 Things to Consider for Mobile Self Storage? If yes, then you might as well read residential self storage Ermington. If you’re looking for something else, you can try other posts as well or call us if you have specific questions. This entry was posted in Storage and tagged mobile self storage, mobile self storage units, mobile storage, self storage mobile.